Did you try using your friends Facebook pictures in chat ? If not, read this article and try with your friends. Facebook is getting more better and better. Now, you can surprise your friends with a new feature of showing images and other pictures in your chatbox. This amazing trick will impress your friends and they will love it for sure. This chat hack is not officially declared. But you can still use it the way you want. You can add your friends faces, random images, brand names, and other fan pages and group logos and pictures. Just you have to add a pair of double brackets and enter a name or id in between them. 1) Just open your chat box to chat with any of your friend. 2) Try using some common brand logos like Facebook, Google Plus or any other logos with their name..
3) Its a very simple trick to fool your friends. All you have to do is to get a proper id number and id name.The best way to get is via profile link of anything you want. 4) For example, in this screenshot,i have use my friend's profile to show him this trick. In this i have taken example of KFC , : https://www.facebook.com/pages/K-F-C/64264067994.Here i have used [] to use that image in our chat. Similarly , i have used [[cocacola]]. 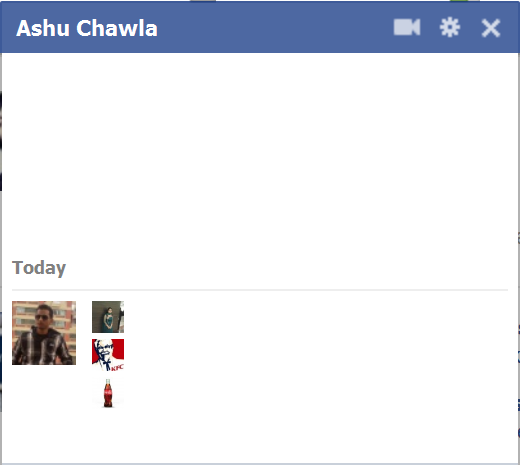 5) This is how you can use any Facebook id profile number or name to use them in your chat. Make sure you are using the [[ ]] brackets. Did you know you can get them ON AUTOPILOT AND ABSOLUTELY FREE by using Like 4 Like?